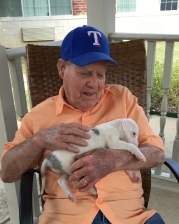 Charley Ray Hanson, 97, of Denton, Texas and former resident of Duncan, Oklahoma passed away Tuesday morning on December 4, 2018 surrounded by his loving family. Funeral services will be held on Friday, December 7th at 11:00 AM at First Baptist Church in Duncan. Interment will follow at Marlow Cemetery under the direction of Don Grantham Funeral Home. The family will receive friends at First Baptist Church at 10:00 AM prior to the funeral service. Charley (Bill) Hanson born to Burrell and Artie Hanson on January 19, 1921 in Alma, Oklahoma. Charley grew up around Loco/Alma area, where at 6 yrs old when his father died, he hunted the woods to feed his mother, sister and brothers. He served in the U.S. Army from 1942-1946. After his service he married Thelma Ward on March 13, 1948, they were married for 70 years and made their home in Duncan where he worked for various Oil Field Companies. The family moved to Loco in 1965 he continued working in the Oil Field and owned the local cafe. He enjoyed fishing, OU Football and Texas Rangers. But, retirement was just not a word to him. He was busy working with his hands until the end. Charley is survived by his wife, Thelma Hanson and six children, Roberta Scroggins of Kerrville, TX, Ronald Bolton of Lone Grove, OK, Rose Lee of Denton, TX, Billy Hanson of Krum, TX, Patricia Griffith of Noble, OK and Jerry Hanson of Ardmore, OK; 18 Grandchildren, 35 Great Grandchildren and 4 Great-Great Grandchildren; and his twin sister, Faye Anderson, of California. Charley is preceded in death by his son, Robert Bolton of Lewisville, TX and his daughter, Connie Rains of Duncan, OK.